HAPPY NEW YEAR! I hope you all had a wonderful holiday. I took some time off from the computer this holiday season to spend time with my family. At first it was hard to tear myself away, but then as the days passed it was actually nice to take the break. I still didn’t clean out my closet like I’d hoped, but just chilled out. I cooked some incredible dishes for my family, and by the time New Years rolled around the only thing my husband wanted was a hamburger – so that’s what we had. The temperature here in the Midwest has been like a roller coaster. One day it was in the 20s, then jumped to the 60s. Then yesterday we woke up to snow with temperatures expected to hit the -3 mark by Sunday. Brrr! We celebrated my moms 92nd birthday the day after Christmas, and my sisters birthday on New Years Eve. It’s been nice having everyone close to home this year. Wintertime has always meant comfort food to me with breakfast dishes that can be served all day long. Today I’m sharing these Individual Vegetable Frittata’s in Puff Pastry. They’re so easy to prepare and perfect for breakfast, brunch, lunch or dinner. Plus they can be made ahead of time or prepped and completed just before serving (see tip). I think you’ll enjoy these. Use whole eggs or egg whites whichever you prefer – they’re sure to be a hit with everyone that tries them. Roll out puff pastry sheet and cut into 6" x 6" square or larger. Line ramekins with puff pastry squares, leaving dough hanging over the edges. Do Not Coat Ramekins since puff pastry contains butter already! Add egg with remaining ingredients into a bowl and blend. Carefully add approximately 1/4 cup of the egg mixture into each ramekin. Place ramekins on a preheated tray in a 350F degree oven for approximately 20-25 minutes or until egg is firm and puff pastry golden brown. Remove from oven and allow to cool for 3-5 minutes. Run the blunt side of a knife around the inside edge to release puff pastry if needed. With a large mouth spoon scoop out the frittata and place onto a plate. *Tip: These can also be made in muffin tins. If you're looking for perfection - line muffin tins with puff pastry, then insert another muffin tin on top and bake for approximately 10 minutes. Remove from oven. Place egg mixture inside and continue baking until eggs are firm, approximately 15 minutes. If puff pastry starts to brown prior to eggs getting done, cover with foil. Then serve. You’re so funny. Well you should make one at least this weekend and enjoy it. They’re quite yummy! You’re welcome. I hope you’ll try it. Thank you for stopping by. What a wonderful idea! Great company brunch dish…and so many ways to tweak these gems. Happy New Year, my friend! I agree there are so many ways you can make this. Whatever your palate dictates you can create. I hope you’ll try these. Happy New Year! LOL I prepared some oven French fries for my husband because that’s what he had wanted! Your pastry frittatas looks lovely. Happy New Year to you and your family, Vicki, and I look forward to another year of your beautiful creations. Thanks Angie. It wasn’t so bad having burgers. I’d made so many fancy meals during the holidays that burgers were a nice simple treat. French fries sound yummy as well. I make tons of frittatas, but never individual ones, and certainly not ones with puff pastry. These look great! Such a fun idea. Happy New Year! They’re delish! I hope you’ll try them Happy New Year! Look delicious!!! Happy New Year Vicki !! These look really nice for early morning breakfast. I always pack individual frittata for my daughter’s breakfast when she leaves early for school. Its easy to eat on bus. Using puff pastry is a great idea, I will try it. Happy New Year! You’re such a nice mommy. Your daughter is very lucky. Let me know what you think if you give these a try. Happy New Year. Hope the New Year brings all you need and most of what you want and pushes all the unpleasant matters onto a different path! Yes, do make frittatas, no, have never made individual ones . . . look very appetizing 🙂 ! Thank you Eha for the nice New Years wish. I hope 2014 is the best year ever for you and me. 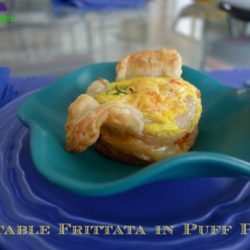 What a great idea for this individual portion…and yes, puff pastry is just perfect with this frittata. Thank you and same to you. I hope you’ll try these. What a delightful idea for mini frittatas. Delicious and cute too! And a Happy New Year to you too Vicki! What a way to start the year. These frittata’s look amazing. I love the use of puff pastry! Thanks MJ I hope you’ll try these, they’re yummy. Sometimes it’s great to take a little break from blogging and then come back with renewed energies and inspiration. Love these gorgeous puffl pastries. Thank you Daniella. I still seem to be having a slow start to the new year. Time to get in gear.I hope you’ll try these. Happy New Year Vicki! Me too, after sharing Japanese New Years Foods, I took several days off and it was nice! It was almost hard to come back. I haven’t shoot for the blog this year and I already feel a bit awkward even going through work emails. =P Your individual fritattas look yummy! I need to stock puff pastry again and make this one for lunch with my kids. They will love it! Puff Pastry always makes everything taste better. It’s no wonder with all the butter in them. I hope you’ll try these. I too am having a hard time getting a jump start on the new year after taking some time off. I needed the break. This is such a neat dish! 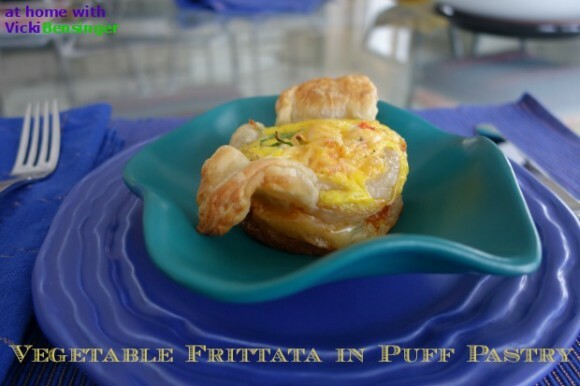 Love the idea of frittata in puff pastry. Great post! Thank you I hope you’ll try this. Don’t forget to use all your favorite fillings. Happy New year! These look so delicious, Vicki! Love the way the frittata is served in the pastry! Very pretty! Thank you Kathy, I hope you’ll try these. Dear Vicki, Happy New Year to you!! I am sure that you delighted your family with delicious meals filled with love and joy for the holiday. What a beautiful blessings to celebrate your mom’s 92nd birthday. Happy birthday to your mom. I understand sometimes a good burger seems to hit the spot like nothing else, along with some really good fries! This is a wonderful breakfast, lunch or dinner. I love frittatta. Thank you Catherine. I hope you had a wonderful holiday. Happy New Year. What a clever idea. Perfect when having a brunch for friends…I think they would love it. These are delicious. I have to say that if you’re on ther until they’re easy enough to eat in the car like a sandwich. I hope you’ll try these. I love this idea so much! Frittatas are always a hit and this is such a great way to serve them! Thank you. I hope you’ll try these. Did you order Dufour puff pastry, or did you buy it at a market? I usually can find any ingredient, but have not found it here in CA. I am soy-sensitive and most puff pastry has lecithin (soy) as an ingredient. I know Dufour is supposed to be pure butter. I got it at Whole Foods but have seen them at other speciality markets as well as kitchen stores. There should be a Whole Foods in California, hopefully it’s close by. I hope that helps.